Samurai Jack was a popular animated series on Cartoon Network created by Genndy Tartakovsky. 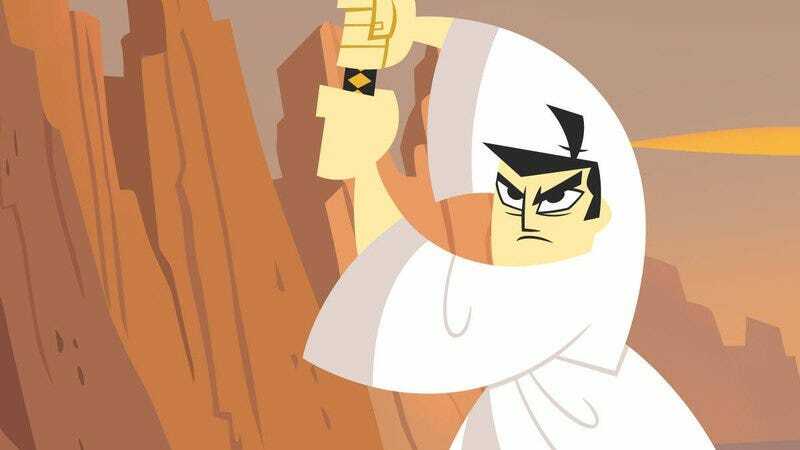 Tartakovsky cut his teeth on such favorites as Batman: The Animated Series and The Powerpuff Girls, as well as creating Dexter’s Laboratory before creating the iconic character of Samurai Jack. Jack was a samurai warrior voiced by comedian Phil LaMarr and waged many battles with the evil wizard Aku. The series developed quite a cult following and led to Tartakovsky being tapped to create the successful Star Wars: The Clone Wars series for Cartoon Network. Audiences last saw Samurai Jack in action in 2007—a feature film rumored to be produced by J.J. Abrams has been in development hell since at least 2009 and a comic book series has continued his adventures on paper—but now YouTube user Avemagnadude is attempting to sate the Samurai Jack faithful with an extremely short but effective tribute to the fish out of water samurai warrior. The short culls influence from Shaw Brothers’ exploitation, Kurosawa high-art, and just a touch of Tarantino to pay tribute to Jack. The animation style is smoother than the original’s masking-based animation style (the new tribute appears to be completely computer animated) but still retains the tone of the original series.